All of Pat's workshops and presentations are based on current research. The presented strategies, ideas, and activities can be implemented immediately into classrooms with little or no prep time. Information teachers receive is not an add-on to their curriculum; instead, it shows ways to instruct and work with the existing curriculum. Each of the following workshop presentations can be tailored directly to the needs of your district and schools. Presentations can be directly aligned with state and district curriculums. Pat can show educators how to effectively and efficiently implement the Common Core Reading and Writing Standards. Specific information about the presentations is listed below and on the downloadable brochure. There are certain keys that unlock the treasure of becoming a life-long proficient reader. This presentation will look at specific, research-based activities and instructional strategies that are used by highly effective readers. Some specific areas that may be focused on are listed below. This workshop will show specifically how to organize and use learning centers in the classroom. Learn how centers can be utilized and managed with minimal teacher preparation and planning. One of the keys to using centers successfully is to provide activities that are multi-leveled and stay consistent throughout the whole year. The directions for the activities do not change. What changes each week is the how the students apply and utilize learned skills through the activities. * Meeting the needs of a variety of students through the utilization of learning centers. * Management of centers on a daily basis. writing, science or social studies theme. * Ideas that allow students to be actively engaged in meaningful work. * Create centers that can be used all year with minimal preparation time. students to; show what you know. How does instruction of reading and writing differ for students who find them difficult? This presentation will give a wealth of strategies and activities to answer that question and help struggling learners become successful. Learn how to help students transfer the strategies used in small, guided groups to independently using them when they read and write. Some specific areas that may be focused on are listed below. One of the hardest parts of working with small, guided reading groups or needs-based groups is the management piece. This presentation will show how to successfully implement small, guided reading groups in classrooms with minimal interruptions and maximum time on task. One of the keys to a solid management system is consistency. Time used for direction giving is at a minimum, while instruction and practice is at a maximum. Some specific topics that may be focused on are listed below. Teachers will be shown a wealth of specific assignments to use with any grade level, any curriculum area, and multi-levels of student achievement. All assignments and activities can be coordinated with school, district, and state curriculums. This workshop is a practical, use it tomorrow, guide for differentiating instruction in a whole group setting. Pat will show you how to work with your whole class so that everyone is actively involved and attentive. The activities and strategies discussed can be used across the curriculum with a wide-range of learners. different abilities may benefit from them. Differentiation instruction in your classroom does not have to be overwhelming. This workshop will help ease your way into differentiation using the five Windows of Opportunity. You'll leave with a wealth of easy-to-use ideas, activities, strategies and routines that will enable you to have success with differentiation in your classroom. What makes guided reading different from other types of reading instruction? Discover the key elements of guided reading including using powerful coaching strategies. Teach students how to monitor their comprehension and engage them in the reading process. This workshop will give a repertoire of ideas, activities, and strategies to help students with organizing, studying, and working with content area curriculum. This presentation will show teachers how to help students become strategic and proficient writers. Techniques and activities that help writers solve problems will be shown. Assigned writing tasks as well as creative writing will be addressed. Some specific areas that may be focused on are listed below. This workshop will show participants how to easily and effectively differentiate instruction and assignments so all students can be successful. Learn how to support the struggling students as well as challenge the proficient ones. 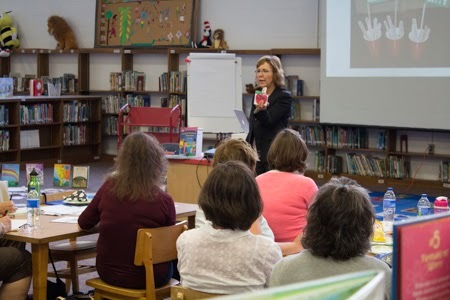 Ideas, strategies and activities will be centered on the areas of reading and writing. science or social studies theme. The Common Core Standards (CCS) define what knowledge and skills students need to know. They do not define how teachers should teach or how students should learn. Pat will show you specifically how to work with the common core standards through practical, research-based instructional strategies. You will leave with ideas, activities and strategies that can be used the next day to implement the Reading Common Core Standards. with evidence and dig deeper rather than just restate and give surface-level answers.